If you've ever wished that your controllers had more blood on them - and rapid-fire modifications in them - you're in luck. There comes a point in every gamers life when he wishes that that the games he played were bloodier. Hamstrung by squeamish developers, unwilling to unleash a digital ocean of crimson, they must look elsewhere to sate their gnawing urge for blood. Thankfully, there's now a murder-themed controller available that adds an extra splash of the red stuff to every game you play. 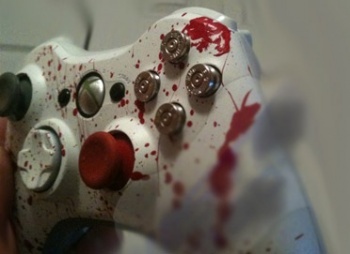 Using a Xbox 360 controller as a base, the "Real Murder Controller" replaces the face buttons with nine millimeter bullet casings, dumps the standard green quadrant LEDs and the right thumbstick in favor of bright red replacements, and decorates the whole thing with a few spatters of fake blood. The changes aren't just cosmetic either, as the controller includes an eight mode rapid-fire mod that should help you get the drop on the competition. It will cost you twice as much as a regular, unmodified controller however, putting it way outside of impulse buy range. Still, with Halloween just around the corner, it seems exactly the right time to buy a seasonally appropriate treat that you can use all year round.